A Near Future Sci-Fi/Romance/Intrigue set in the mid-2040s. What Lissa Bruce knows could kill her. 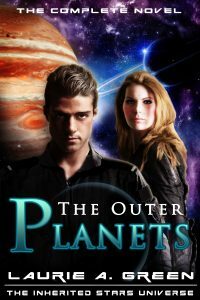 A female video reporter with an altered identity and a damning secret joins the crew of a research mission bound for Jupiter and Saturn, only to find the past she wants to escape is already onboard. Lieutenant Mitchell Coe, the loyal aide de camp to a murdered General–and Lissa’s late spouse–is the one man with the power to blow her cover…or salvage her heart. But after a series of malfunctions threatens the mission, Lissa suspects she’s not the only one aboard with a dangerous secret.